Left - "Pink my Ride", Middle - "Son of a Peach", Right - "Plumalicious"
Top -"Pink my Ride" Middle -"Plumalicious" Bottom - "Son of a Peach"
BeautyUk as its name suggests is a UK based cosmetic company that has been running for 5 years. Their philosophy is that make up should be fun, and at affordable prices. We have all fallen victim to fashions and sometimes this comes at a price, isn't it great that brands like this offer as up to the minute trends in make up, allowing us to experiment and play around with colours and tones that we wouldn't normally go for without breaking the bank. Don't get me wrong I love a Mac lipstick just as much as anyone but with their prices rising every year or so its hard to keep on trend at £15 a pop, and what if the colour doesn't suit you? You're left with a perfectly formed lipstick in the bullet and have no option but to give it away or admire it from a distance. 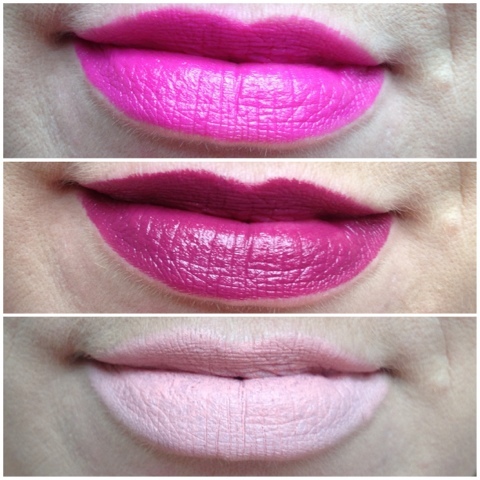 I know there are many brands out there which offer lipsticks at more affordable prices, but sometimes this is due to a lack of pigmentation and longevity. 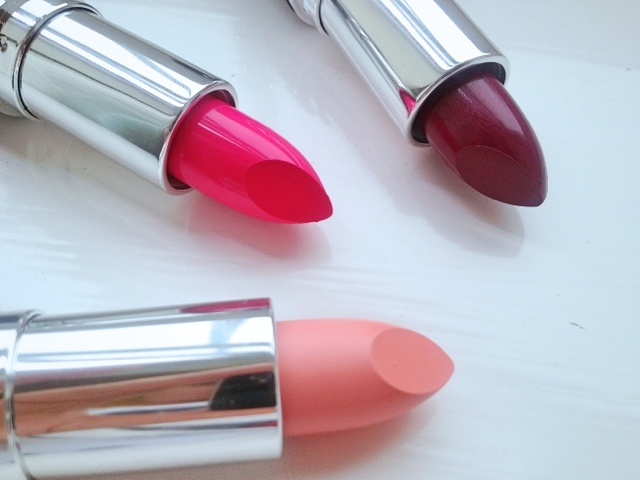 Even the high street, which offer a fantastic range of colours and finishes are bumping up their prices, most Rimmel lipsticks start at £5 now, so its really hard to find a cheaper brand which offer everything you get with a higher valued label. 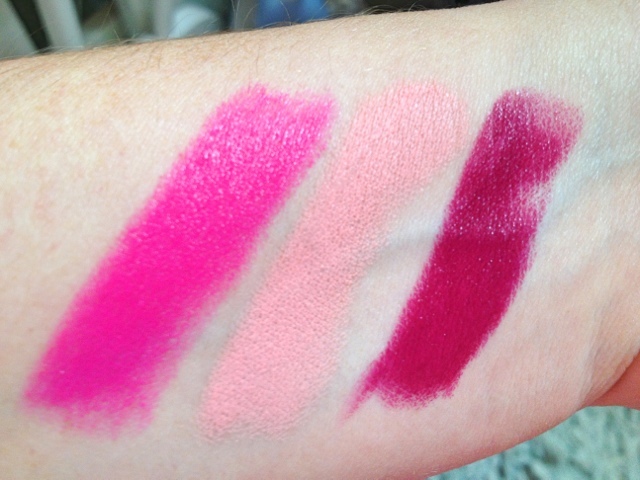 The pictures above are some of the offerings of lip colours from BeautyUk , their prices are £3.49 per lipstick which is nothing to shy away from. Son of a Peach* ( I love the name) is a matte formula, a very pale peachy, pink colour. As it is matte the texture can be a little drying but paired with a lip gloss it can give a stunning pale lip colour. It may not suit every ones taste but the pigmentation can not be faulted. Pink my Ride* is more of a crème finish which is instantly moisturising, offering a sheen to the lips that is long wearing. The colour itself is a gorgeous blue toned fuchsia pink that adds a pop of colour and great for a statement lip look. Plumalicious* is bang on trend for this Autumn/Winter session, a stunning deep purple with pink and blue undertones. The creamy formula makes it a lot more wearable than it looks in the bullet and ( like most deeper shades of lipstick) has brilliant staying power. All in all I think these are fantastic value for money and well worth a try when you're next in line for a new lip colour. Have you tried any products from Beautyuk? I would love to know what you thought of them. I have all of these they are gorgeous and I love the finish too. I love how bright the colours show up - I'm always worried about the pigmentation with cheaper products but these seem to work!! Hi Lou, new follower here! 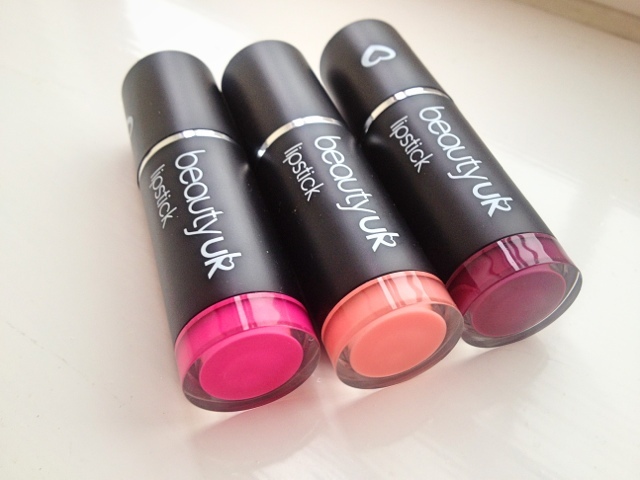 I absolutely love these lippies from BeautyUK, I have 3 shades so far- that Pink my ride is definitely next on my list! Keep up the lovely work, I look forward to reading more of your posts!